Who is my current, favorite, smart blogger writing about the side of photography that has to do with thought and theory and not "nyquist-crappola-equivilence-gear." ??? Oh yeah. That would be Mr. A. Molitor. He's been writing great stuff over at "Photos and Stuff" for a enough time to prove to me that he's on to something good and that he had a great, cynical sense of humor. No disclaimers needed here. He's not trying to sell you anything and, on this post, neither am I. Go read some of A. Molitor's stuff if you are getting bored here. Warning: I think he's smarter and funnier than me. Sad. For. Me. I just read a fun, smart book about photography. Not about gear; just about photography. You might like the book and it might be a nice holiday break from....THE GEAR. 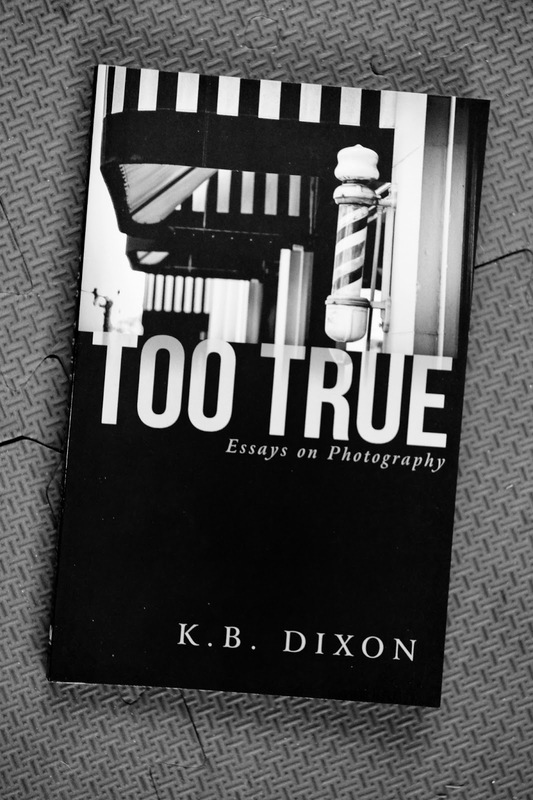 "IN A NEW COLLECTION of idiosyncratic essays on the subject of photography, Too True, K.B. Dixon offers a close-up look at an enduring fascination. A writer and photographer, Dixon comes at his enigmatic subject from every direction---from the experience of reading Roland Barthes to the question of posing, from the art of the author photo to a real time history of the Vivian Maier phenomenon. He provides the reader with a distinctly personal take on the many mysteries of a maddening medium." I have read his books, "A Painter's Life" and "The Photo Album" and enjoyed them both very much. But a word of warning, these are not "how to" books. They are books about ideas, feelings, and the flow of life--- in the life of an artist and a writer. In this book Dixon discusses topics ranging from a critic's appreciation of photographer, Garry Winograd, to the writings of Janet Macolm, to ideas about Vivian Maier and her awkward posthumous legacy. The essays are like interesting meals in that you can sit down, read one and feel satisfied and then return again and have a different dish the next day. I particularly like his observations about posing. Not physically posing, per se, but more the affectation of posing. If you like terse, dry, non-fiction then this is NOT the writer for you. If you want to be amused and understand something we all have a passion for (photography) from another (smart) person's point of view then you'll likely love the book. At 130+ pages it's not going to tire you out. You won't have to revisit your studies of Claude Levi-Strauss from the philosophy courses ALL OF YOU SHOULD HAVE TAKEN IN COLLEGE in order to enjoy the essays. They are, for the most part, light-hearted and non-destructively cynical. Fits right in with the VSL POV.